Charlie Rayward has respectfully preserved the very best elements of his Grade II Listed, 14th century Cotswold cottage, and created an enduring family legacy along with it. Restoring The Knappings was always going to be much more than simply a renovation project for Charlie Rayward – this is the home that he grew up in as a boy, and so has known for most of his life. ‘My parents bought the house in 1973,’ explains Charlie. ‘My dad was very much into self-sufficiency and we had a big vegetable garden and chickens – the grounds were bigger then,’ he reminisces. When Charlie’s mother sadly died, he renovated the barn that is in the grounds of the house to live in himself and to be close to his father. Then, in 2001, after his father passed away too, Charlie moved in to the house. This is not to underplay the extent of the work entailed in creating a far simpler interior with integrity. In fact, the house was the subject of an early episode of Channel 4’s Grand Designs. Charlie appeared on the show with his then wife, and Kevin McCloud watched as they took the house back to its more original state. The couple camped in the garden and stayed at a friend’s house while they worked on the interior. Charlie remembers the endless stripping out, which the first stage of work demanded, to rid the house of its superfluous additions – from the fitted kitchen, to the built-in wardrobes and fitted carpets his dad had installed in the 1970s. Stud walls were removed so that the kitchen could be one large room – it had formerly been divided to create a utility room – and the small room that had been used as a pantry next door was repurposed as a study. Maybe the most arduous part of the stripping work, however, was working on the many beams in the house, which had been painted with thick, sooty black paint in Victorian times. Charlie called on friends to help make light work of the job, while the cameras rolled to capture the process for the programme. Next, Charlie installed the essentials for modern living. The house was rewired, replumbed and ‘a green boiler and lovely new cast-iron radiators were installed.’ Keen to preserve the fabric of the building, Charlie also had the terracotta tiled floors and wide elm floorboards cleaned and polished, windows were repaired, and doors rehung – one of which was found in the garden and was reinstated in its original place. 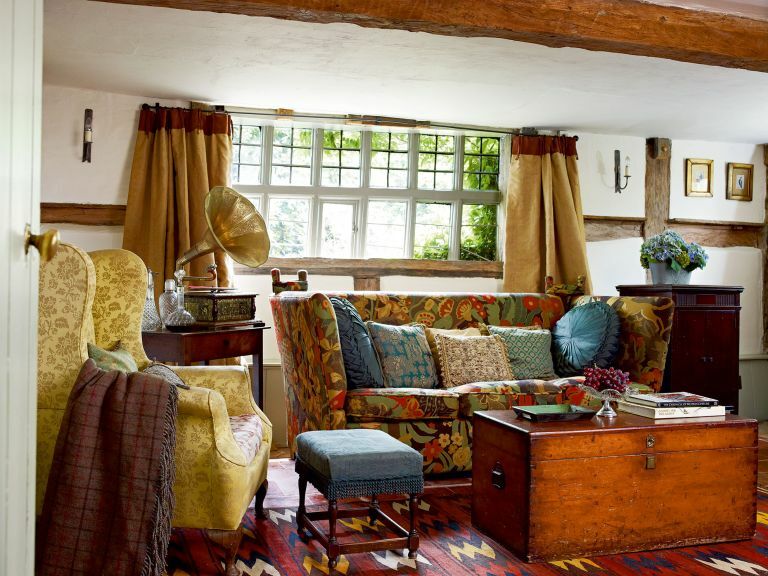 He preserved the original floors, which are wonderfully warped and wonky, and to allow the period lath and plaster walls to breathe, distemper and heritage colours with traditional pigments were used on the walls and beams. Charlie remembers craving ‘an almost plain, pared back look’, to reveal the best features of the house and ‘keep things simple’, while his wife at the time wanted to decorate in ‘a more colourful palette’. ‘I think we came to a good compromise,’ he explains. By the time paint brushes were put down, the project had taken a year to complete, not without a last push for the final filming day ‘reveal’ for Grand Designs. Charlie again enlisted the help of friends ‘with people everywhere helping: painting, cleaning windows, sewing’, including Upstairs Downstairs in Cheltenham, who Charlie had asked to make curtains in heavy hessian, ‘to go with the rustic feel of the place’, as well as many other soft furnishings and curtains in the house. ‘Bringing the house back to its original look felt like a good thing to do,’ says Charlie of the results of his labour and those happy times. ‘It wasn’t altered in any major way; it still smells the same, of the wood, and has the same very nice feel. I think I felt a responsibility to do it this way, having had it passed down to me,’ he adds. Charlie has since spent more than a decade enjoying The Knappings, but now feels that it is finally time to move on. ‘I do love the house, but my circumstances have changed,’ he explains. ‘I want a different life in Wales with my new partner,’ he says of his imminent plans. He admits that he will miss the feel of the house, which is full of so many fond memories, the fact he sleeps so well there, and using the workshop in the garden to work on odd jobs, repairs and hobbies. But he will also leave knowing that he has left the family home he has treasured for so many years, with its very best elements preserved for a new family to enjoy, hopefully for many generations to come. Charlie’s tips on treating original beams.